After poking at the issue a few times (look for CBS’ new show CSI: CEO, starring Nicholas Cage, Rashida Jones, and Kevin James this fall), Colbert moved onto the rest of the world in human awfulness (Hi, Fox News’ Kimberly Guilfoyle), promising, “I’ll have some more to say about this over there at the desk later—assuming we make it past the commercial break.” Well, following the first commercial The Late Show was back, and Colbert did have some stuff to say. 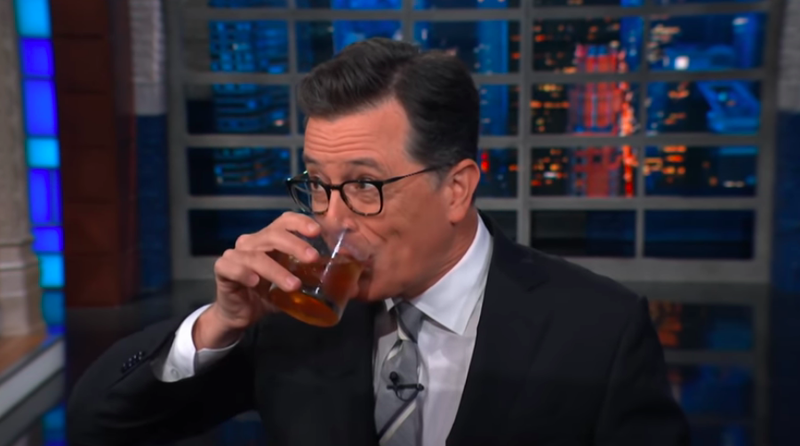 Colbert has long been a champion of the women accusing powerful men in his industry of abusing that power (and of Farrow’s investigations thereof), and kicked off his four-minute address by restating that support. Speaking of the last year’s worth of women coming forward, Colbert called the fact that the #MeToo movement has empowered women to do so “an objectively good thing,” continuing, “It sounds strange to have to say this. Powerful men taking sexual advantage of relatively powerless employees is wrong.” Calling himself “naive, on a certain level” for being personally shocked at the unending roster of outed entertainment industry predators, Colbert yet was clearly struggling with his response to Moonves’ inclusion on that list.